The CE Shop is an award-winning company that is focused on education that matters. Whether you’re looking for Pre-Licensing, Post-Licensing, or Continuing Education; we have you covered. 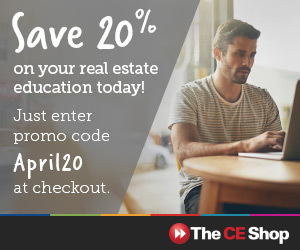 Great real estate agents never stop learning, and we’re devoted to innovating and evolving as you do. With courses written by industry experts and easily accessible from anywhere through our innovative online platform, you can rest assured that the things you learn will actually be useful on the job. Looking for online CE courses? Click the picture below to access our online CE Shop. Continuing Education Completion Deadline is 4/30/2019 to avoid the $200 processing fee.